Laurel MS has grown so much and now has a full day of shopping and dining to offer. There are so many cute stores in Laurel now and one of my favorites is Misty's. I have been shopping there for years. They have a large selection of dresses and so many fun outfits to choose from. It is hard to find Uncle Frank and Ivy Jane anymore. I love those 2 lines and they are made to flatter us moms and grandmoms. Misty's specializes in flattering cuts and clothes for your special occasions. I had a very difficult time picking just 4 looks. The accessories look like they were made to go with each outfit. The first dress had a beautiful easy cut with stripes in the right place to flatter the figure. I, of course, loved the bright colors. I love black and white especially when the pieces have stylish details. 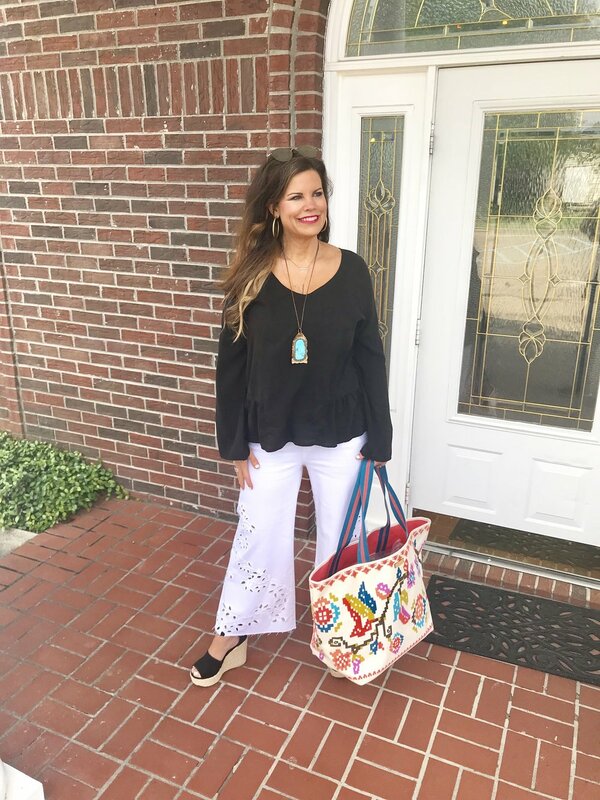 These flare ankle jeans with the cutouts are so different from my plain white skinnies. I will definitely wear them anywhere. Can we ever have too many black tops? Yes, unless they are this cute. This top is sooo flattering. Next, I tried something I don't do too often anymore( a dress that fits like a glove). I thought my husband was going to stop breathing when I walked out in this one. 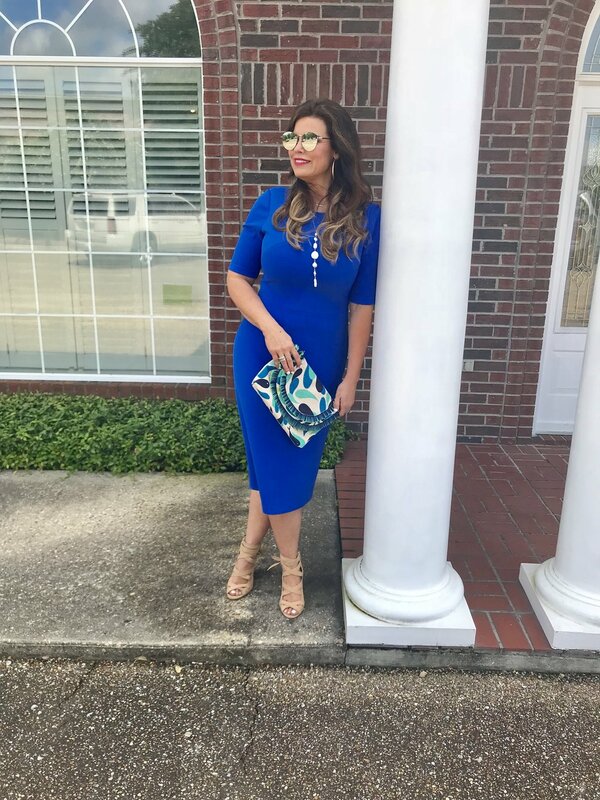 This dress is very fitted but the high-end material hugs the curves to perfection with a little help from spanx. When it comes to fitted dresses there is no looking expensive for $40. You just need to buy a good one. 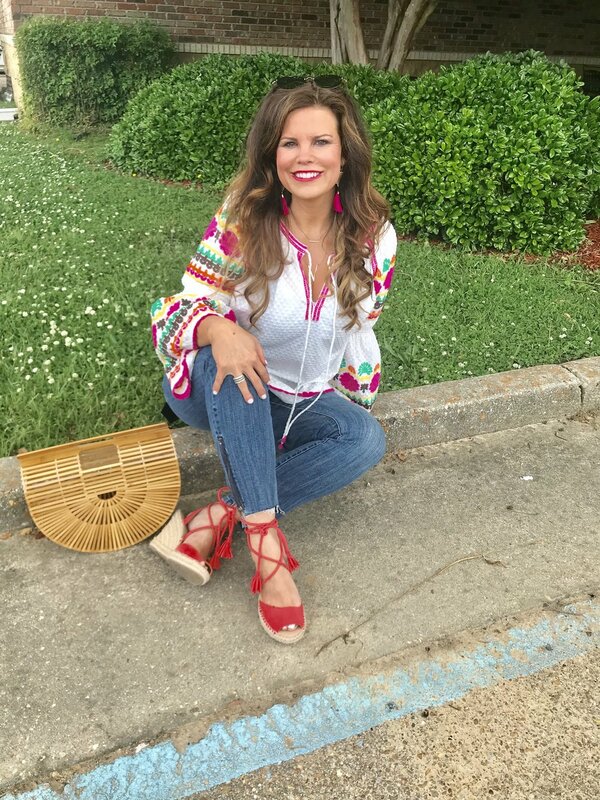 I am totally obsessed with this peasant blouse! The embroidered sleeves are simply gorgeous. The Kut jeans are made for our changing bodies. You may follow Misty's on Instagram under Misty's or Facebook under Misty Byrd Foster. Misty is offering a 20% discount on one item to anyone who mentions Southern Shine. When you visit Laurel you are going to thank me..... Happy shopping and let it shine!